2019 LA Marathon is Sunday, March 24. Major road closures in effect 5am to 2pm. Event day Hotline 310-550-4680. 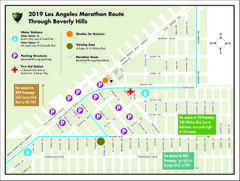 The 2019 LA Marathon takes place Sunday, March 24. Major road closures in effect from 5am to 2pm. •	Burton Way closed from Doheny Dr. to South Santa Monica Blvd. •	South Santa Monica Blvd. closed from Rexford Dr. to Rodeo Dr.
•	Rodeo Dr. closed from South Santa Monica Blvd. to Wilshire Blvd. •	Wilshire Blvd. closed from Rodeo Dr. to South Santa Monica Blvd. •	South Santa Monica Blvd. closed from Wilshire Blvd. to Moreno Dr. Follow detours and drive safely around all road closures.